The Pacific Northwest last saw a big earthquake about 300 years ago. Scientists widely expect the region to experience a similar event every 500 years on average. Scientists believe an episode of tremors could someday trigger a so-called megaquake on the offshore fault called the Cascadia Subduction Zone. The 700-mile-long fault runs from Vancouver Island to northern California, and can unleash earthquakes of up to magnitude 9.0. It’s one of the biggest of faults in the U.S. While older models suggest that the locked zone is mostly shallow and offshore, the location of these tremors indicates that in a big earthquake, layers of rock jerking past each other may take place closer to Seattle than previously thought. “That increases the risk that it could be closer to the population centers, which means stronger shaking in the Puget Sound cities,” Creager said. Also unknown is the timing of the next big earthquake. The Pacific Northwest last saw a megaquake about 300 years ago. Scientists widely expect the region to experience a similar event every 500 years on average. “It could happen anytime in the next few hundred years but it could be tomorrow,” said Creager. Most of the year, the offshore Juan de Fuca plate pushes against the North American plate and moves parts of Washington and Vancouver Island to the east. Then, around every 14 months, a series of tremors slides the North American plate back a few millimeters. 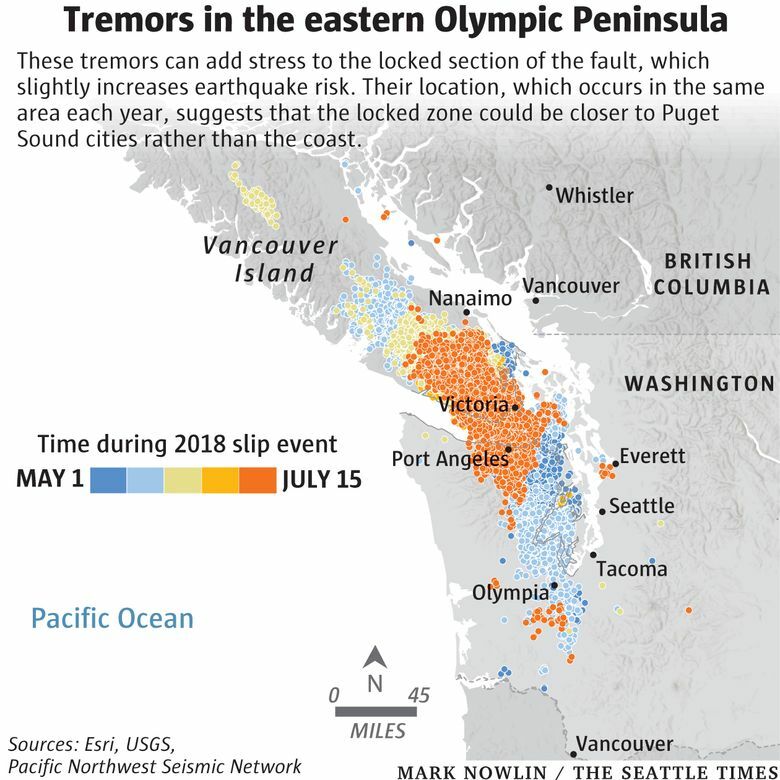 This year’s tremors moved the eastern portion of the Olympic Peninsula and southern Vancouver Island about 5 millimeters. 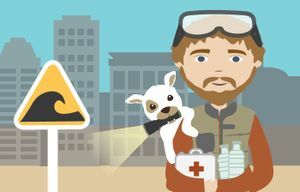 Canadian seismologist John Cassidy said that episodic tremor and slip is helpful for understanding the process of subduction, when one plate goes under another. “It helps us understand where the fault zone is locked, and where it’s storing energy for a future earthquake,” Cassidy said, adding that calculations about the strength and type of shaking are folded into building codes. Although these tremors have likely been occurring for hundreds of years, the process of episodic tremor and slip was only discovered in the early 2000s and much more research has to be done, Cassidy said. The slower nature of these tremors allows scientists to better understand ruptures, which are much harder to study in the seconds-long duration of most earthquakes. Science reporter Sandi Doughton contributed to this report.